I feel pretty lucky right now - I'm actually getting some new cars to drive. The auto companies have cut way back on their press fleets, a move I and many other journalists think is short sighted. When you get right down to the nitty gritty, press cars are very inexpensive advertising - as long as we, the mighty press (Does that sound as pompous to you as it does to me? ), like the cars. Thankfully for Mazda, one company that actually has 2010 models in their fleet, I like their cars. The Mazda 6 was the most recent Mazda I've driven. Instead of providing a top of the line model, Mazda sent out a mid-line i Touring Plus. In many ways this is a smart move. Instead of letting us all drive the most expensive version, we get to try a version that many people who have to plunk down their own hard earned cash might buy. I like the looks of the 6 series better than the 3 series, it's less angular and more flowing to my eye. I found the interior, although extremely functional, uninspiring and I really don't know why. Everything was well put together, the controls were easy to reach, but there was just something. Maybe it was the cloth seats. They did seem to be a bit stodgy; maybe it was the beige color. This Mazda 6 was powered by a 170 hp, 2.5-liter, DOHC four cylinder and was coupled to a 5-speed automatic transmission (I just heard somewhere that over 80% of all new vehicles are equipped with automatic transmissions). Like the vast majority of cars today, the power is delivered through the front wheels. The suspension and brakes seemed to be better than the engine, which is as it should be. I want brakes that are fit for a car with at least 100-hp more than the car they are on, that way you should never find yourself exceeding the brakes' limit. Fuel economy is rated at 21-city and 30-highway; I got 26-mpg in my mixed driving. The base price is $23,750, and the car I drove had a price of $25,030. I think this is a decent price for what is an excellent driving car. Mazda offers an i SV, i Sport, i Touring, i Touring Plus, i Grand Touring, S Touring Plus, and S Grand Touring; the last two models 272-hp, 3.7-liter V6. 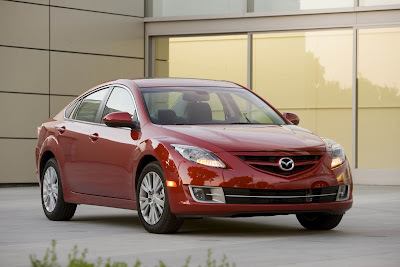 Look for a full-length review of the Mazda 6 i Touring Plus in the Pacifica Tribune on November 11, 2009.